We’ve polled thru-hikers, selected, and seeded the best restaurants on the Appalachian Trail. Winners from the first two rounds have advanced to the Elite Eight. 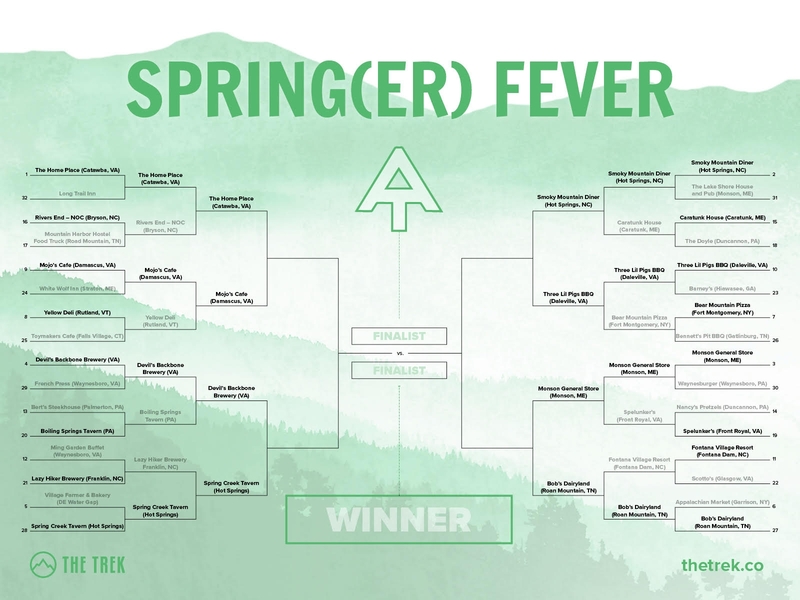 It’s time to once again vote on your favorite restaurants in our Springer Fever Bracket. Help choose who advances to the Final Four. Elite Eight voting ends midnight 4/2 (PT). Final Four voting 4/3-4/6. Championship voting 4/7-4/8. #9 Mojo’s Cafe has received more votes than any other restaurant through the first two rounds. Mojo’s now faces the #1 seeded Homeplace Restaurant in Virginia, and could be an interesting matchup. At #28, Spring Creek Tavern is the highest ranking restaurant still in the tournament. #3 Monson General Store in Maine is the only restaurant above the Mason Dixon Line still in the tournament. They are well over 1,000 trail miles from the next closet restaurant still in the bracket, making them the undisputed King of the North. Vote for Bobs Dairyland! Amazing fresh food made from scratch! Hard working employees!Health conscience owners who make sure you are served quality food! bobs dairyland has delicious food. friendly faces and a clean restaurant!!!’. we get by there every chance we can. Love eating at Bob’s Dairyland. I vote for Bob’s Dairyland!! Great food! Great service!! Clean family restaurant. I vote The spring creek tavern…awesome place great beer selection. Kelley farm kitchen in harpers ferry. Giant portions, amazing food, wonderful owners. I was at The Monson General Store the day it opened. I love, love, love the store, the food, employees and the story of how it came to be! The entire store is made of reclaimed resources or Maine made! They are truly the last stop on the trail before the wilderness trek to finish!